^ Brown, Hutch (Summer 2000). 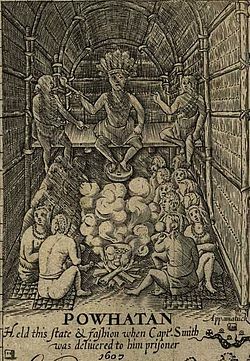 “Wildland Burning by American Indians in Virginia”. Fire Management Today (Washington, DC: U.S. Department of Agriculture, Forest Service) 60 (3): 30?33. ^ http://www.wm.edu/niahd/journals/index.php?browse=entry&id=4965[リンク切れ] c.f. オジブウェー語: danakamigaa: "activity-grounds", i.e. "land of much events [for the People]"
^ http://etext.virginia.edu/etcbin/toccer-new2?id=JefVirg.sgm&images=images/modeng&data=/texts/english/modeng/parsed&tag=public&part=all Archived 2013年8月29日, at the Wayback Machine. Gleach, Frederic W. (1997) Powhatan's World and Colonial Virginia: A Conflict of Cultures. Lincoln: University of Nebraska Press. Gleach, Frederic W. (2006) Pocahontas: An Exercise in Mythmaking and Marketing." In: New Perspectives on Native North America: Cultures, Histories, and Representations, ed. by Sergei A. Kan and Pauline Turner Strong, pp. 433-455. Lincoln: University of Nebraska Press. James Rice, Nature and History in the Potomac Country: From Hunter-Gatherers to the Age of Jefferson, 2009.